Ecuadorian beauty Angela Bonilla, a 24-year-old, make-up artist, from Urcuqui, Imbabura province, bested 39 candidates from around the world by winning the Miss Global 2016 crown at the finals night held on September 24 at the Plenary Hall of the Philippine International Convention Center (PICC) in Pasay City, Philippines. She was considered as one of the top favorites to win title ever since the pageant commenced a few weeks prior to the coronation finals. Miss Global 2016 Angela Bonilla being crowned by outgoing Miss Global 2016 Jessica Peart. Bonilla, who also won the Miss Photogenic and Best in Swimsuit special awards, was asked at the final question-and-answer round, who between a man and woman was a better judge in a beauty contest. “I believe in equality, and both man and woman are qualified to be a judge“. Miss Philippines Camille Hirro finished first runner up and Miss Australia Caitlyn Henry as second runner up. Miss Czech Republic Nikola Bechynova and Miss Norway Britt Rekkedal were third and fourth runners up respectively. 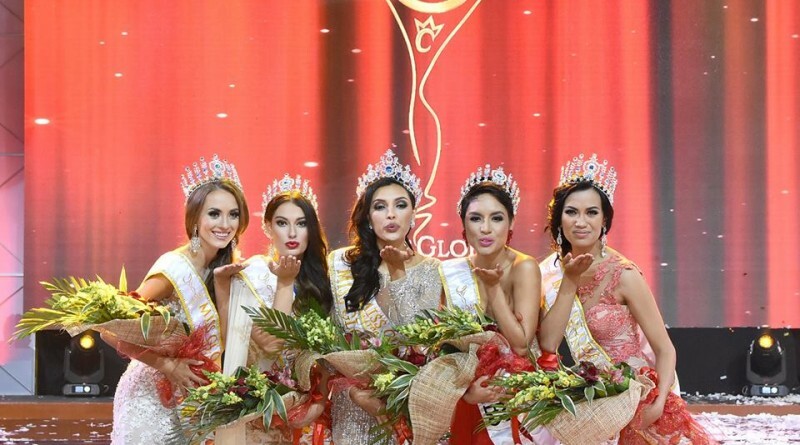 Miss Global 2016: Angela Bonilla, Ecuador; 1st Runner -up: Camille Hiro, Philippines; 2nd Runner-up: Caitlyn Henry, Australia; 3rd Runner-up: Nikola Bechynova, Czech Republic; 4th Runner-up: Britt Rekkedal, Norway. It was also interesting to note that this is the second time for the 5-foot-8 student of journalism at Universidad Tecnica Particular de Loja to compete in an international pageant. She competed in Miss Earth 2015 in Vienna, Austria where she was unplaced. The others who made the Top Ten were the delegates from Canada, China, India, Kenya and the Netherlands. The Top 20 included the delegates from Botswana, Bulgaria, Cambodia, Chile, Iran, Nigeria, Russia, Sweden Trinidad & Tobago, and Ukraine. The Miss Global 2016 pageant also featured two international pageant winners with the likes of Miss Global 2015 Jessica Peart from Australia, who passed her crown to Bonilla, and Miss Universe 2005 Natalie Glebova from Canada, who co-hosted the finals with actor Derrick Monasterio and Miss Philippines Earth 2013 Angelee Claudett Delos Reyes, and tv host, Bobby Yan. Moreover, it was a wonderful coincidence that on the same calendar date of September 24, 2016, Ecuador (Angela Bonilla) wins (Miss Global 2016) in the Philippines, while The Philippines (Jeslyn Santos) wins in Ecuador (Miss Continentes Unidos 2016). Surrogacy is very popular all over the world. The primary reason of it – a wifes get the newborn child’s mom after childbirth. Large part of wifes wish be a mom, but some of them haven’t possibility. By this reason in last years a new data appeared – surrogate. When gestation is medically unrealizable, there is only one way to be a mom. It is surrogate. Also, in these events enjoy dollar satisfaction. In fact, to find a soundness girl – needfull to ask medical service which grant this kind of help. We commend to use this surrogate mothers hospital. In these organization in Ukraine a lot of womant from USA, Great Britain and another European countries became surrogate mummy. According to the law surrogate is legal. The validity and charges of surrogacy are very various. It depends from location, nationality, color of the skin, etc. In our hospitals you can make a option about kind of surrogacy. We advise for all our users to use traditional surrogacy. But our serve hold gestational surrogacy. In Feskov clinic are designation for surrogacy. When you enter to our organization in Ukraine – a member of Feskov Human Reproduction Group, you get a consultant. This manager will consult you about different things from the push till the stop. However, surrogate continues 9 months. Then the manager gave all necessary acts and you can accept the child. As rule, the consultant receive information your family next months. It you want to obtain a child, we recommend to go there http://www.mother-surrogate.com. Managers which are able to help there are very important. They will response for all your questions. If you needfull any care, they will help you. On web-site you can detect contacts. As rule you can detect values and packages. Technical support can help you at English. You can make select of it. If you want to receive advice about mom surrogate as a process, A.Feskov will get advice for you. vientre de alquiler es muy conocido en todas partes del mundo. La causa fundamental de eso es que una mujer llega a ser madre para neonato despues su parto. Muchas de mujeres desea ser una mami, pero algunas de ellas no podria ser. Por este motivo en el siglo pasado un termino novedoso presento – vientre de alquiler. Cuando embarazo es medicamente irrealizable, hay solo una solucion para ser una mami. Esto es gestacion subrogada. Por lo general, en estos eventos se utiliza compensacion monetaria. En realidad, para buscar una esposa sana hay que buscar apoyo que proporciona este tipo de ayuda. Recomendamos utilizar estea donantes de ovulos centro. En estea organizacion ucranianoa muchas de las mujeres de EE.UU., GB y otras regiones se hacen madres de alquiler. De acuerdo con la ley gestacion subrogada es legal. La licitud y gastos de gestacion subrogada son muy diversos. Depende de localizacion, religion, color de piel, etc. En nuestrosas clinicas puedes tomar una eleccion sobre un tipo de subrogacion. Aconsejamos a todos nuestros miembros utilizar subrogacion convencional. Pero nuestro servicio contiene tambien la gestacion subrogada. En loslas agencias de Feskov son designaciones por vientre de alquiler. Cuando ingresa a nuestrosas organizaciones basadosas en Ucrania – una parte de Feskov Human Reproduction Group, tiene un gerente. El gerente se consultara sobre momentos diferentes desde el principio hasta el fin. Sin embargo vientre de alquiler dura 9 meses. Despues el gerente prepara todos los papeles necesitados y Usted puede adoptar al nino. En principio, el gerente obtiene la informacion su familia proximos meses. Si tiene que recibir un nino, recomendamos ir alli mother-surrogate.com. Lideres que trabajan alli son muy importantes. Ellos responderan a todas las preguntas. Si necesita algun recomendacion, ellos se ayudaran. Tambien ellos adjuntaran documentos antes este metodo. En el sitio web Usted puede observar contactos. En principio puede descubrir gastos y servicios. Asesoramiento tecnico pueden ayudar en idiomas diferentes. Usted puede tomar opcion por eso. Si quiere recibir consultacion sobre gestacion subrogada como un proceso, Alexander Feskov asesoria para Usted.